Lovely bright 1 bedroom apartment in Vinohrady in a brick building with a lift. The apartment is AVAILABLE IMMEDIATELY for LONGTERM RENTAL. 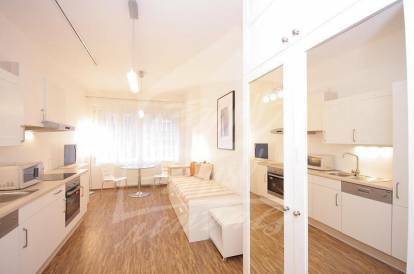 It is offered unfurnished with fully equipped kitchen. Kitchen offers fridge, freezer, dishwasher, glass hob with el. oven, and there is space for breakfast table. Bathroom with a shower, toilet is separate. There is lot of storage space in the hall. Great location near park Havlíčkovy sady, square Náměstí Míru, with many restaurants, cafes. Utilities are paid separately, energies directly to the providers, security deposit 1 month rent. Energy Performance Certificate is not available, so it is described as class G.
Interested in this property, ID 35293?